Coffee. It’s a language of the world – some economies crave it nearly as much as people do. And I’m definitely no different. Many times, caffeine and an increase in my work productivity go hand-in-hand, especially on a late night. 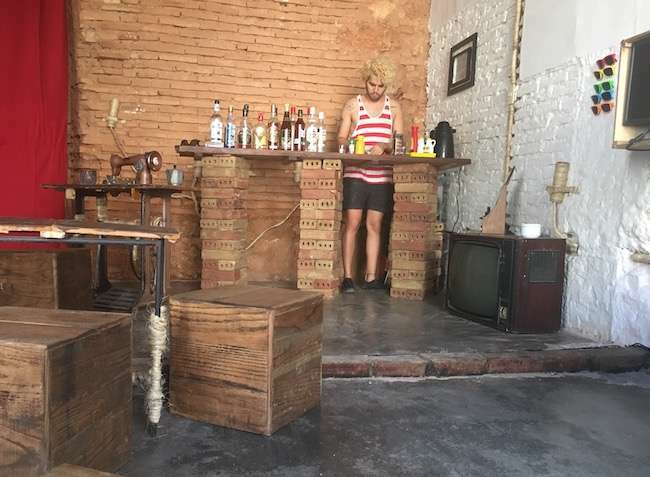 So you can imagine how I felt when I stumbled upon El Mago coffee bar in Trinidad, Cuba. Years ago, I’d go with parents to pick up decaf (the horror!) coffee from Dunkin’ Donuts and wonder my parents ever bothered with the drink. Then came college, and late nights, and early mornings, and eventually just a job that required both of those things, and I finally learned the importance of a really good coffee. To some, tasting good coffee is done more for hobby than it is caffeinating. And though I don’t fit into this particular group, I’ve certainly met my fair share of people who aren’t coffee fans at all – even in New York City. El Mago coffee bar menu. Simple yet stylish. But this blog post is for those coffee lovers out there who happen to find themselves in Trinidad, Cuba and can’t seem to find a decent iced coffee. So, alas, after many weeks searching, I’ve found my go-to shop right in Trinidad, Cuba. The place is called El Mago coffee bar, and believe me, it’s a must-visit. Decor in El Mago coffee bar. Tables and a bench (left/top) with hanging chairs (right/bottom) overhead. The décor is the first thing that grabbed me. It screams Brooklyn, maybe a touch of the Lower East Side. As you walk in, you’re greeted on your left-hand wall by murals’ worth of original graffiti art with messages in both Spanish and English. As you continue into the building and look around, you can’t help but notice the several pieces of antique, wooden furniture suspended from the ceiling, which also double as light-fixtures during late-night visits, in addition to the antique equipment laid out all over the venue. Beyond the décor, the music keeps me more than satisfied. As someone who appreciates a wide variety of music, from electronic to folk and beyond, the playlists operated by Carlos, the lead host, are spot-on and keep the crowd happy both during the day and throughout the evening (closing sometimes at 2 or 3am!). The menu is extensive, with a variety of drinks both cold and hot, with and without alcohol. I’ve visited three times now – twice during the day and once at night – and have never been disappointed by the price point (<$1 – $4 per drink, depending on the alcohol and ingredients). The bar at night is fully stocked as well, and I’d be remiss if I didn’t urge you to take a peak at different hours! At this point, I’ve tried out different caffeinated frappes, have managed to avoid issues with the ice, and have also taken our clients to the coffee shop to share the experience. It’s a peaceful piece of New York tucked away in a colonial time capsule… and it certainly beats the heck out of a $5 Starbucks coffee back home! Thank you El Mago coffee bar! Matt is a 20-something New Yorker who's constantly on the move. If you catch him abroad, you'll likely find him with just a backpack and (hopefully) a tan. An avid traveler, Matt loves to connect and trade stories with like-minded backpackers from all over the world.